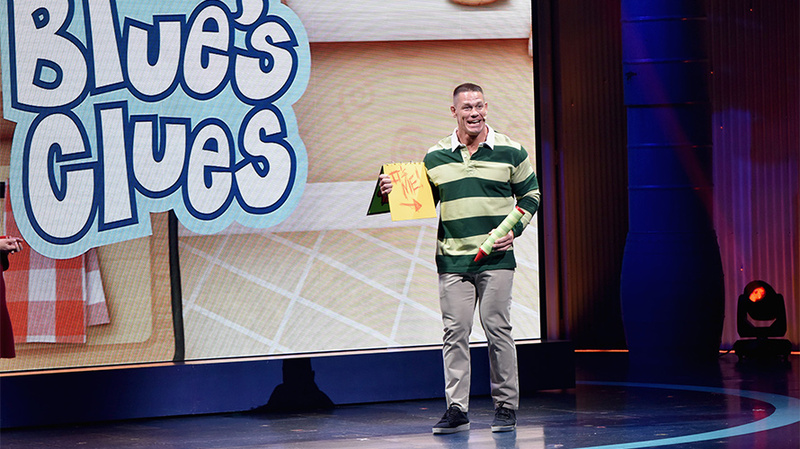 During last Tuesday's Nickelodeon upfront, John Cena jokingly threw his hat in the ring to host Blue's Clues. During Nickelodeon’s upfront event last Tuesday, Nickelodeon Group president Cyma Zarghami emceed most of the proceedings, but John Cena spent almost as much time in front of the audience of advertisers, buyers and Viacom staffers. The WWE superstar and actor made several trips onstage at New York’s Palace Theatre, the home of the new hit SpongeBob SquarePants: The Broadway Musical, to talk about all of the projects he has in the works for the company. 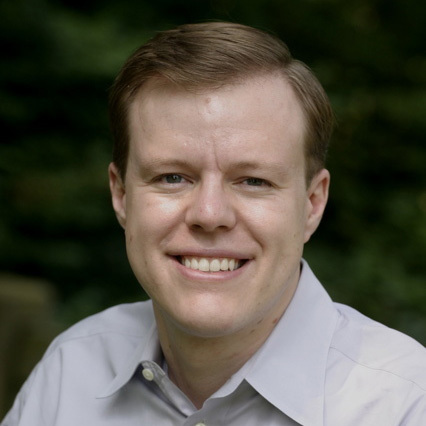 But none of his appearances was more amusing than when Cena strode onstage after Pam Kaufman, Nickelodeon’s CMO and president of consumer products, announced that the network would be reviving one of its most popular shows, Blue’s Clues, for a new generation of preschoolers. The series—which ended its original run in 2006—will feature a new, live-action host and CG animation. Cena donned the green-striped rugby shirt worn by previous hosts Steve Burns and Donovan Patton, and jokingly said he was auditioning for the role, since he was already doing so many Nickelodeon shows. That tweet went viral, sparking a wave of stories speculating that the audition was real, and that Cena indeed was in consideration for the hosting job. The wrestler contributed to the speculation himself by Instagramming a caption-less Blue’s Clues photo. But as all the buyers and advertisers in the Palace Theatre audience were well aware, Cena was never actually auditioning for the role. It was all just an upfront bit, one of many involving talent, network execs and buyers that upfront audiences will undoubtedly see at many of this year’s events. During last year’s NBCUniversal upfront, the company played a clever video in which Ice-T, in character as his Law & Order: SVU alter ego, interrogated buyers who were strapped to a lie detector machine. And to erase any lingering doubts, Nickelodeon confirmed once again today to Adweek that Cena won’t be the next Blue’s Clues host. The network is holding a casting call next month to search for the revival’s host, on April 14 in Burbank, Calif. While he won’t be a part of the revival, Cena is working with Nickelodeon on three other projects for 2018: hosting the Nickelodeon 2018 Kids’ Choice Awards on March 24, for the second consecutive year; executive producing a new game show Keep It Spotless, which premieres later this month; and voicing a new villain, Baron Draxum, in Rise of the Teenage Mutant Ninja Turtles, the network’s reboot of the famous franchise, due to air later this year.